Principal Cast : Eli Marienthal, Jennifer Aniston, Harry Connick Jr, Vin Diesel, Christopher McDonald, John Mahoney, M Emmet Walsh, James Gammon, Cloris Leachman, Ollie Johnston, Frank Thomas. Synopsis: A boy makes friends with an innocent alien giant robot that a paranoid government agent wants to destroy. What we think : …Unassailably great, The Iron Giant is an iconic piece of Hollywood animation, storytelling and good ol’ heart-and-soul. Driven by affecting performances, a warm-hearted story and terrific animation – both traditional and CG – this film will make your heart sing at the same time as the tears flow. Although not for really young kids, it’s a film most of the family can enjoy at just about any age. Brilliant. I promise, you will cry. Because “Suuuuppperrrrrrmannnnnn”. Not often animated films make me cry. Pixar’s Inside Out was one such film; after thinking about it, I realized only one other had achieved this monumental feat (I don’t normally cry in movies, I cry all weird and stuff) and it was Brad Bird’s directorial debut, The Iron Giant. Released in 1999, at a time when traditional hand-drawn animation was beginning to look antiquated against the shiny new digital stuff coming out of Pixar and Dreamworks; Warner Bros took a bit of a hit in 1998 with the release of it’s abysmally performing Quest For Camelot, which sparked fears their soon-to-be-released Iron Giant project, in the hands of former Simpsons animator Brad Bird, would suffer the same fate. Thankfully, while Camelot is now almost completely forgotten (it’s currently listed on DVD on Amazon for a tad over $4), The Iron Giant remains one of Warner’s crown jewels of animated glory. The Iron Giant is one of those projects that, for whatever reason, just captures the zeitgeist of both time, place, and casting. It would be Brad Bird’s directorial debut – he would go on to helm films like The Incredibles for Pixar, a Mission Impossible movie, and the more recent Tomorrowland – and, if you ask me, it’s still his best. Infused with some of the most loving, natural, glorious storytelling, The Iron Giant is an insta-classic that remains a cult favorite even now. Reverent adults look back somewhat nostalgically to this film as a standard bearer of a quality amalgam of hand-drawn artistry and computer generated animation, a largely non-ideal mix vaguely similar to oil and water (see Atlantis for a worst-case scenario example). 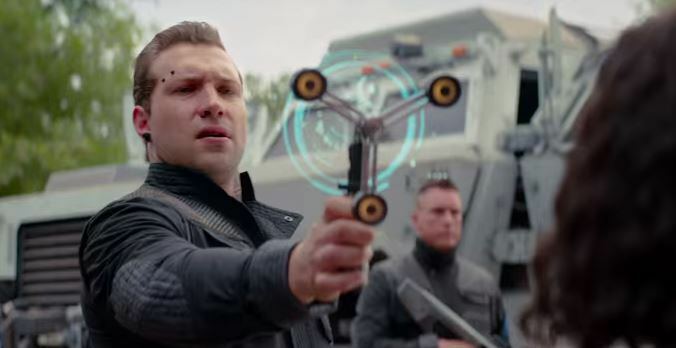 The film’s subtext of paranoia, anti-guns and fear-mongering are molded within a typically boys-own-adventure sense of fun. Hogarth Hughes (voice of Eli Marienthal, who would perhaps be better known as Stifler’s little brother in American Pie, also in 1999) lives with his mother, Annie (Jennifer Aniston), in the town of Rockport, Maine. A quiet, sleepy fishing town, the sudden appearance by an enormous robot (Vin Diesel), which is befriended by Hogarth, places the town in danger – it’s 1959, and the height of American paranoia over Russia’s Sputnik satellite and the potential for atomic holocaust, and a Government agent, Kent Mansley (Christopher McDonald), sent to investigate mysterious happenings around town begins to suspect Hogarth’s involvement. Aided by Dean (Harry Connick Jr), a local artist and beatnik, Hogarth must try and prevent any harm from coming to the robot when the army arrives to destroy the threat. The Iron Giant was grossly unappreciated by audiences back in 1999. Although a critical hit, the film bombed commercially off the back of what Bard Bird called “a mis-marketing campaign of epic proportions” by Warner Bros. 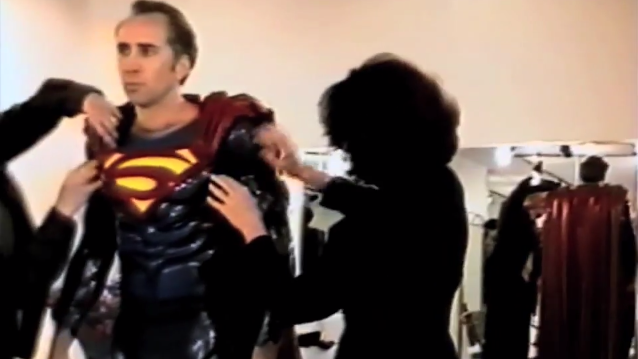 The film cost over $70m to make, and earned back barely $30m, so it was a considerable loss. I was one of the lucky ones to see this in cinemas, and I distinctly recall sitting in a small, pokey auditorium with about twenty other people wondering why I’d never heard of the film beyond a small, indistinct poster in the local newpaper’s “current movies” section. Imagine my surprise to be treated to one of the best animated films of the 90’s, hell, of the last forty years, and nobody had any idea about it. The Iron Giant was cruelly hobbled by Warner’s lack of care for the property, but sure as hell they know it now – the film is soon due for a re-release on HD in an extended version, after considerable remastering – and if you’ve never seen it, or never heard of it, then you owe yourself the genuine wonder of witnessing this movie for the first time. The story’s themes are universal, at least from the young Hogarth’s perspective. What young kid hasn’t ever dreamed of being caught up in an adventure to save his home/town/country? What kid hasn’t wanted for a huge, giant robot as a friend? The fantasy of impossible friendship speaks to all children, an empowerment of youth designed to give kids the catalyst to explore their world and envision a better world for themselves. The idea of a giant robot coming to Earth with an unexplained backstory – at least, the film never ventures a theory as to the ultimate origin of the Giant, and I have not read the book the film is based on – mixed with 50’s paranoia in the form of Kent Mansley’s somewhat narcissistic, fearful government buffoonery – makes for a uniquely specific period film that, while not speaking to non-US citizens who lived during that time, certainly resonates with adults and others for its simple message of peace and understanding, even love. The thing about the film that I love to this day is the relationship between Hogarth and the Giant. Essentially, the Giant is a baby, with no knowledge of itself outside a basic desire to eat all manner of metal, and clumsily hide around the woods outside Rockport. Although voiced by Vin Diesel, the robot’s charm is manifested by its sheer size, as it manhandles things like a baby picks up a toy, crushing and stomping errantly through the opening half of the film. Hogarth’s ability to befriend the Giant, to teach it to be “good” – it’s simplistic, but the film handles it way better than I can explain it – is done with subtlety and charm, thanks to the equally charming screenplay (thanks to former Disney alum Tim McCanlies). Hogarth isn’t a dickhead, nor is he a goody-two-shoes: the film depicts him as a nice kid, prone to childish tantrums, behavioral patterns and casual disobedience, but he’s thoroughly likeable even when he’s doing things he shouldn’t. As the Giant comes to appreciate Hogarth’s humanity, this stirs the conflict late in the film when the Army attacks, forcing the Giant to become “a weapon”, which is exactly what Hogarth is trying to prevent. The film is filled with underlying subtext. On the surface, and perhaps most obvious, is the militarization of a nation’s fear, against imminent attack by Soviet nuclear weapons. A hilariously anachronistic PSA film shown in Hogarth’s school about surviving an atomic blast (“Duck and Cover”) plays on our inherent stupidity and ignorance of legitimate danger and possible attack; remember, this film came out only a few years before 9/11, and in the new War on Terror era, the paranoia themes of The Iron Giant strike particularly hard. So too do themes of gun proliferation. The Giant is, as we learn, a defensive creation, designed to retaliate against attack instead of provoke it. Although armed with some cool weapons of its own, the Giant is only made to use them when it’s attacked by the military; in saying that, the military aren’t portrayed as blithering idiots, but rather complicit in Kent’s stupidity and cowardice against things he perceives as a threat. Threat of the unknown also rises up as a main theme here, with Mansley’s furtive, overtly bureaucratic insanity is the film’s main thrust of antagonism. The story manifests around some eminently relatable characters. Hogarth and the Giant aside, Jennifer Aniston’s harried mother (whose husband is absent, a sidebar utterly unexplained and never once hinted at) is a prototypical All American Mom, working long hours at a job to support herself and her son, initially unbelieving about the Giant and, when the truth comes out, is only worried about her son’s welfare. 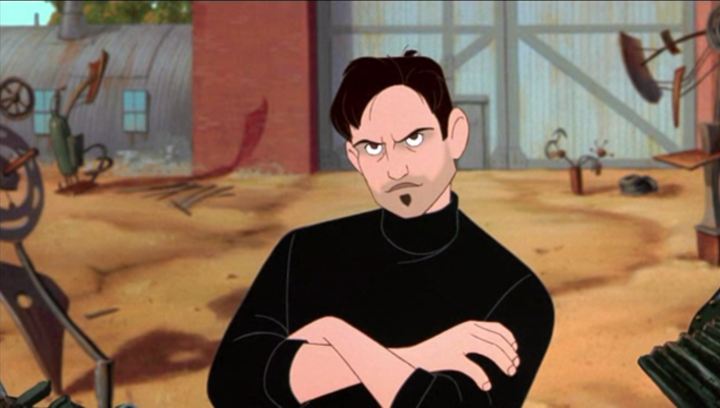 Harry Connick Jr’s suave, smooth Dean, an artist who just happens to collect scrap to turn into works of “art”, provides a father figure of sorts for Hogarth, and although you get the sense that Dean will end up with Annie by the film’s credits, this isn’t a subplot pushed into frame at any stage. Bird’s focus is on Hogarth and the Giant, and everything else seems to become… well, not secondary in any way, but less detailed. Much of the film’s sidebar plotting is told in thick brushstrokes, allowing the main narrative, of Hogarth and the Giant, to drive the film forward. Christopher McDonald, who most will recognize from his role as Adam Sandler’s main golfing rival in Happy Gilmore, is brilliant as the nasty Kent Mansley, while Frasier’s John Mahoney brings his considerable raspy voice to the role of General Rogard, a solid, stand-up military man who arrives with his troops to combat the Giant. If the film has a strength away from the story and characters, it’s in the animation. 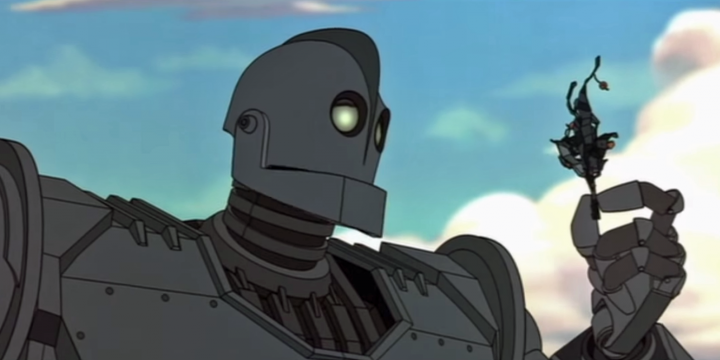 The Iron Giant is beautifully rendered, a combination of both traditional artistry (in the backgrounds, and main human character work) and computer generated material (the Giant, ocean waves, and other bits and pieces), but they’re seamlessly integrated in almost every aspect. The film has that warm, 50’s sense of innocence about it, a casual, post-war joy that quickly gives way to propagandizing by Mansley and militaristic carnage by Rogard. Colors pop, the loving depiction of small-town USA and the ubiquitous peace and quiet about things, and the vivid iconography Bird draws on with his film make it not only a feast for the brain, but the eyes as well. The film was presented in a widescreen aspect (most animated films, particularly back in the 90’s, came along in the more TV-friendly 1.85 aspect – Bird would also bring the 2.35 aspect to Pixar’s The Incredibles) and it just looks brilliant. 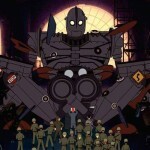 The Iron Giant is, if you’ll pardon the pun, a giant of an animated film. 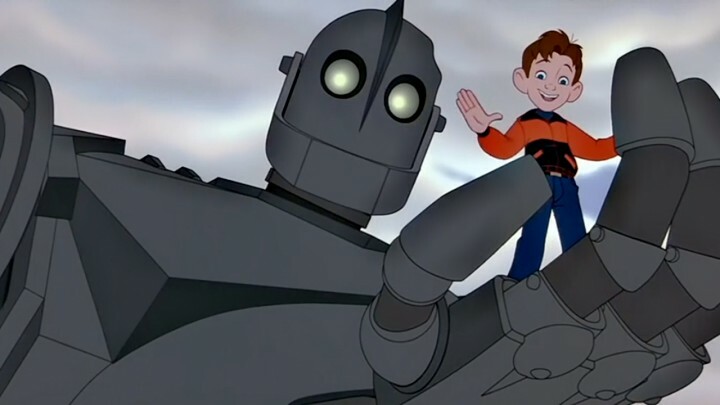 Told with love, featuring an ending that’ll have grown men sobbing into their sleeves, and an all-out love of nostalgic reminiscence, The Iron Giant deserves your time. Not many films are essential viewing, but for anyone with a passing love of animation, The Iron Giant should be a must-see for kids and adults of all ages. As I noted above, some of the moments in the film perhaps aren’t for the really young kids (the film depicts a dead deer at one point, and a particularly violent attack by the Army at another) but this is quality family viewing that rewards in both contextual storytelling and tremendously affecting characterizations. If you haven’t seen The Iron Giant, you really should. If you have, then see it again.